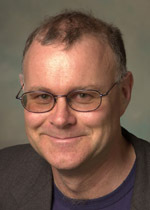 Tim Kyng is Associate Professor in the Department of Applied Finance and Actuarial Studies at Macquarie University. He completed a PhD in Applied Mathematics in 2011 at the University of Sydney. He previously completed a BSc degree in Pure Mathematics and a Master of Statistics degree in 2011 at the University of New South Wales, and a Master of Economics degree at Macquarie University in 1992. He qualified as an actuary in 1993 and is a Fellow of both the Institute of Actuaries and the Financial Services Institute of Australasia. His research deals with the assessment of risk using sophisticated computer-based mathematical models and their application, such as pricing stock options and comparison of retirement village contracts for consumers. Tim worked in the financial services industry for several years, gaining experience in investment, banking, and insurance. Before joining Macquarie University in 1997 he was a consultant for Coopers & Lybrand, advising clients on financial risk management. The Institute of Actuaries of Australia appointed him the chief examiner for its professional examinations in Finance between 1996 and 1998, and again between 2002 and 2003. Ferris, S., Parr, N., Markey, R., & Kyng, T. (2015). Long service leave: past, present, and future. Australian Journal of Actuarial Practice, 3, 5-22. Kyng, T. J. & Kostandatos, O. (2014). 'Multivariate Monte-Carlo simulation and economic valuation of complex financial contracts : an Excel based implementation 'Spreadsheets in Education, 7 (2), Jan-38. Tickle, L., Kyng, T., & Wood, L. (2014). The Role of universities in preparing graduates to use software in the financial services workplace. International Journal of Mathematical Education in Science and Technology, 45 (2), 200-213. Kyng, T., Tickle, L., & Wood, L. (2013). Perceptions of the software skills of graduates by employers in the financial services industry. International Journal of Mathematical Education in Science and Technology, 44 (8), 1224-1238. Kyng, T., Tickle, L., & Wood, L. (2013). Academics' perceptions of the use and relevance of software in quantitative and financial disciplines. International Journal of Mathematical Education in Science and Technology, 44 (2), 214-231. Kyng, T. & Konstandatos, O. (2012). Real Options Analysis for commodity based mining enterprises with compound and barrier features. Accounting and Finance Research, 1 (2), 216-225. Kyng, T. & Taylor, P. (2008). Graduates' Use of Spreadsheet Tools in Learning and Applying Financial Mathematics. Asian Social Science, 4 (3), 66-77. Kyng, T, and Taylor, P. (2008) Graduates' Use of Spreadsheet Tools in Learning and Applying Financial Mathematics, Asian Social Science 4, 3. 66-77. Kyng T. J. (2011) Valuing ESOs using the exercise multiple approach and binary P-options. Institute of Actuaries of Australia Biennial Convention 2011. Kyng, T. (2009) Images and Barriers on the Road To Real Options Valuation, Modeling and Simulation Conference, Cairns. Kyng, T. (2009) Valuation of Multivariate Contingent Claims Using the Multidimensional Binomial Model, Hawaii International Conference on Statistics, Mathematics and Related Fields, Hawaii. Kyng, T. (2008) Graduates’ use of spreadsheet tools in learning and applying financial mathematics, 40th Anniversary of Actuarial Education in Australia Conference, Macquarie University, Sydney. Kyng, T. (2008) The effectiveness of Microsoft Excel as a tool in teaching and learning financial and actuarial mathematics, Learning Excellence and Development (LEAD) Symposium, Macquarie University, Sydney. Kyng, T. (2008) Valuation of Executive Share Options using the Hull White Approach, Quantitative Methods in Finance Conference (QMF), Sydney. Ferris, S. D., Parr, N., Kyng, T., Thornthwaite, L., & Markey, R.(2015) Portable Long Service Leave in the Building and Construction Industry., submitted to Actuaries Institute Biennial Summit. Buchen, P., Konstandatos, O., & Kyng, T. J. (2009). Images and Barriers and the Road to Real Options Evaluation. Proceedings of the 18th IMACS World Congress – MODSIM09 International Congress on Modelling and Simulation 13-17 July 2009, Cairns, Australia, 1487-1492. Paper on study design for evaluation of proposed website for improving statistical and financial literacy of retirement village consumers. Joint work with Ayse Bilgin and Ling Li. about the perceptions of success and failure in IT projects by IT professionals. Paper titled “Hybrid numerical methods for the valuation of executive stock options”. This is joint work with Fabian Gatzka of TUM and Otto Konstandatos of UTS. Retirement Villages online calculator project: This has been funded by a FLA grant of $128K. The project is about the design and implementation of an online calculator comparison tool for retirement villages and an associated educational / financial literacy promoting website. This is an ongoing project expected to take 2 years to complete. ACST829: Capital Budgeting and Financial Modeling: a postgraduate actuarial science unit covering the theory and practice of capital budgeting and financial modelling using spreadsheets. ACST871: Investment and Asset Modeling: a postgraduate actuarial science unit covering the theory and practice of investment. Institute of Actuaries of Australia subject 5B: Financial Derivatives. The Institute of Actuaries of Australia’s specialist finance course on financial derivatives. Last Updated: 2018-06-26 08:12:45 by Mr Ross Brewer.